What Do You Do with Dirt and Trash of One Billion People? In almost six weeks, we have seen no trash trucks, no recycling bins to be emptied, but endless sweeping , everywhere. The trash must go somewhere and that is into piles along the sides of the road. In the mornings, the piles have turned to ashes because the homeless burn the piles for warmth against the chilly desert night. Mumbai allows no burning of the trash piles, consequently the piles are higher there because, of course, they do have sweeping. 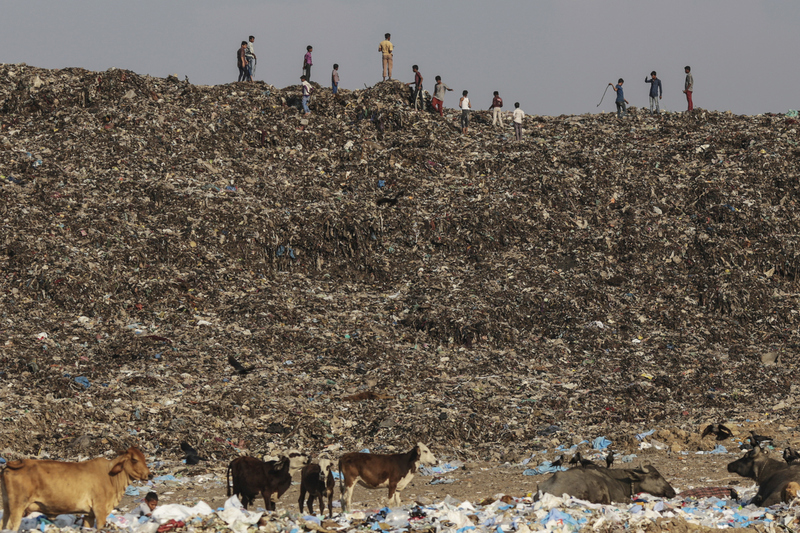 Feral dogs and cattle scavenge for morsels deep inside the trash. Houses along our unpaved lane, deep in the heart of Ahmedabad, are surprisingly upper middle class. In the morning, each house has two sweepers and a boy to wipe the steps and tiles with a rather dirty wet cloth. The pile from each house is swept out onto the lane by women using these ancient handmade brooms. As far as I know, there are no social programs in India. No unemployment insurance, medicare or medicaid or Social Security. Here there are assistants for every job, and much of it seems to be “make work” for the poor. I have no idea how much the pay is, but many people are paid or fed to complete a task that could be accomplished by many less workers. I read that the wealthy don’t hire a driver or a cook but they hire “servants” who do every job needed by the family. It seems whole families can be hired by an affluent family . The poverty slams you in the face , Nothing like I have seen, except in Egypt, many years ago. At this moment in time, the lucky ones here from the 1.000,000.000 population have,at least , a sweeping job. 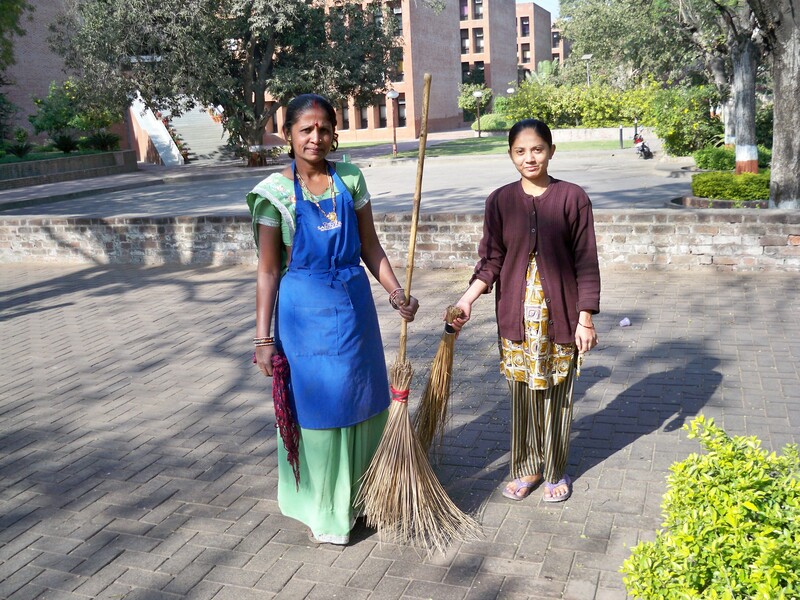 The women in the picture were sweeping at the Indian Institute of Management, a very beautiful complex designed by Louis Kahn. I tried to take a picture of the woman on the left sweeping, but she insisted that she stand next to her friend. Many Indians love to have their pictures taken and then want to see themselves in the camera. So far no one has asked for a “tip” for taking a picture. When we returned with another group in 2015, we were able to see some progress in the trash problem in Amdavad. There were now cans and bins in strategic places around the city. But another step was necesaary. . . the cans were overflowing and need to be emptied. More trash trucks were necessary, though we did see some recycling on the small trucks and carts with separation of various items. There are lots of Dialit people, whom Ghandi called “Chidren of God” who gladly would sort trash and help keep the streets cleaner for little money to buy food. I did have a picture of a blue bin outside the hostel which was always full to overflowing, but can’t find it. One morning , we were on the way to school and as we walked out the gate there was a horrible smell of burning plastic which of course is not safe for breathing. Someone had gotten impatient and want to burn trash as they used to do on the streets at night for warmth. Indians are good problem solvers and entrepreneurs and I have no doubt that during the two years that have passed since we were last in India, that things are improving in the trash removal area! This entry was posted in Animals, Architecture, India, Travel, Uncategorized and tagged Almedabad, architecture, entrepreneurs, IIM, India, Indian Institute of Management, Louis Kahn, sweeping, trash in India. Bookmark the permalink.